Ram Navami is also known as Shri Rama Navami. It is a Hindu festival celebrating the birth of Lord Rama. It is ninth day festival called Vasanta Navaratri. It occurs in the month of March begin with a prayer to the Sun early in the morning. Ramnavami can also be found in the Kalika puran. 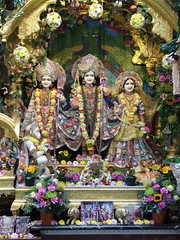 Hindu devotees fast on the day and puja’s are performed at noon, as it is believed that Lord Ram was born at this time. Some people fast on this day. People can eat potatoes in any form without haldi, garlic, ginger or onion. People can eat fruit vegetables, curd, tea, coffee, milk and water. Ram Navami is celebrated in India. On this festival, every temple and house is kept clean. The singing of Bhajans goes on for the puja. The Prasad is distributed among all the people who have gathered for worship. It is one of the five major holy festivals and it is said that keeping this fast, they will get what they want. The original pooja is dedicated to the 9 forms of Devi maha Shakti. these are celebrated in the form of the little girls when we provide for foods and clothes etc we are doing this to the Devi in the form of girls.